This is the first recorded time an airplane passed through Shenandoah County and would have been most local’s first opportunities to see a flying machine. The plane’s arrival brought an excited crowd to the fairground. The Woodstock post office added to the excitement by arranging to have Terrill fly mail from Woodstock to Mt. 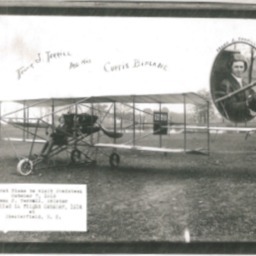 Jackson as one of the first national air mail deliveries. On October 17th Post Master W.M. 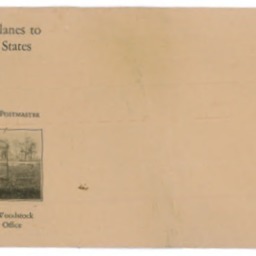 Calvert and Terrill flew several pieces of mail from the Fairgrounds and dropped them near the post office to the delight of most locals. 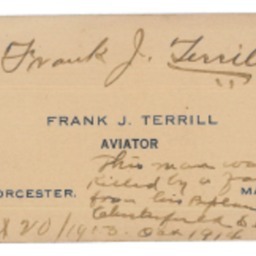 Despite his success in Shenandoah County, Frank Terrill’s days as a pilot were numbered. The dangers associated with early planes soon caught up with him and he was killed at a county fair in Chesterfield South Carolina on November 13, 1914. However, locals would remain enamored with the airplane. As its use expanded, plane culture would become a permanent part of Shenandoah County. Among other things a fighter jet would be displayed at Woodstock’s town park when it opened in the 1960s, helicopter rides would be offered at the county fair during the late 20th and early 21st century, and air plane watching became a popular local pastime that continues to this day. 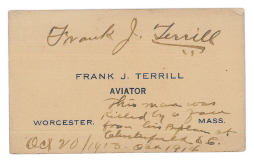 These materials highlight Terrill's early flight and include a photograph of Terrill at the fairgrounds, an envelope from the flight, and Frank's business card. 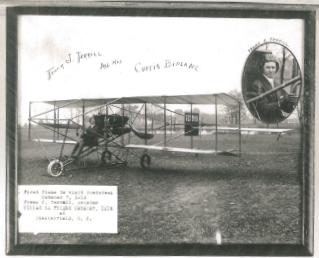 “Airplane Visit,” Shenandoah County Library Archives, accessed April 25, 2019, http://archives.countylib.org/items/show/6925.